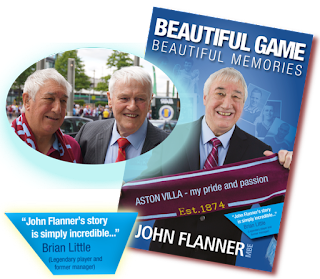 Peter McParland MBE, who scored the two goals in Villa's memorable 2-1 triumph over Manchester United in the 1957 FA Cup Final, will be joining blind super-supporter John Flanner MBE to celebrate the launch of John’s compelling book about his memories of the game. In the book, ‘Beautiful Game, Beautiful Memories,’ due to be launched on 4 May, John pays homage to the Club as he shares the magical moments of football heroes past and present, recounting legendary matches and dramatic events over the past 60 years. Recalling precious memories of ‘Going to the Villa’ with his Dad and son, John said, “I have so many truly great memories and one of the sweetest of all, after several years of heartache, was when the Villa boys turned in a performance that shocked the football world when they beat Liverpool in the 2015 FA Cup semi-final at Wembley Stadium. That memory will live with me forever because it was so unexpected and therefore all the more sweet.